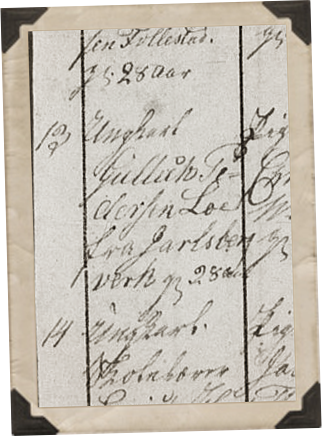 By 1 May 1808 the family relocated to Konnerud. This is where we find Gullik's confirmation. He's now noted as being 14, and the son of Peter Gulliksen Narverudeie.4 It is believed that Gullik's father relocated the family for work. Since life as a crofter was tough, it's likely the growing demand for steady work in the nearby mining town of Konnerud enticed Peter and his family to take the 20 kilometer trek. 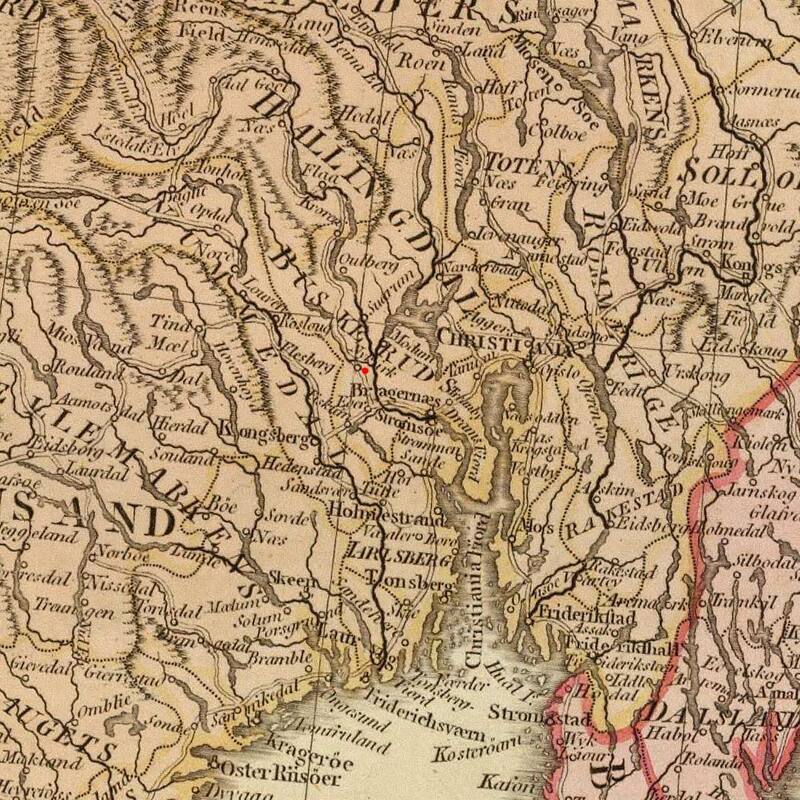 Gullik's Confirmation Record (1808)Narverud consists of a group of mines located in Daleråsen in the Nedre Eiker municipality. Narverud mines have the largest collection of Iron Ore deposits in the region. The only mine open in Peder's time was "Dronning Mauds stoll" [Queen Maude's drift] which opened about 1697 & was operated by Dikemark ironworks from 1780-1820. 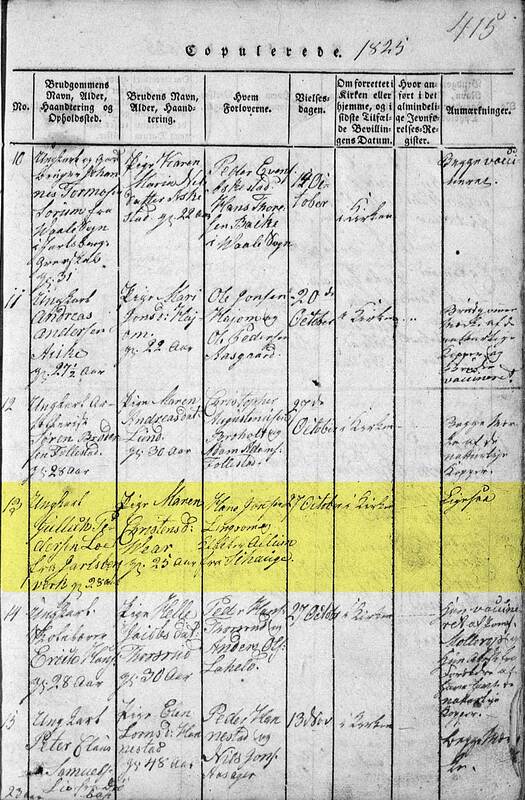 On 27 Oct 1825, in Røyken church, Maren Christensdatter Wear married Gullik Pedersen Loe "from Jarlsberg Verk”. Both Maren and Gullik had smallpox. “Gullik is physically scarred and Maren lost one eyeB from fighting smallpox,” is mentioned in the church book. Maren had as her best man, Hans Jonsen Lingsom from Royken, while Gullik had the clerk of Skoger, H.G. Allum.10 H.G. is described as the most famous clerk the village has had. He was a diligent writer, and states that he had more of a desire to write than keep up with school. He wrote a poem for the wedding. 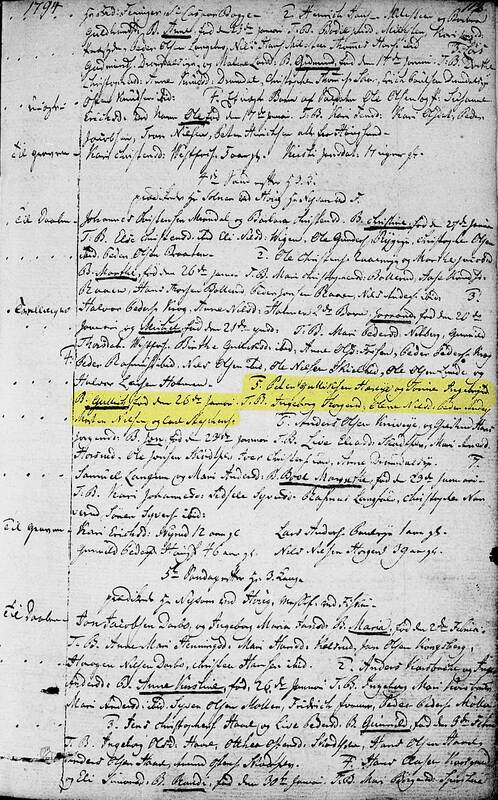 Gullik & Maren's marriage record lists Gullik as being from "Jarlsberg Verk". Since we know this was not actually his birthplace, we can assume it's where Gullik was living at the time of his marriage. "Jarlsberg Verk" was in Konnerud and official known as the “Jarlsbergske Silver, Lead and Copper Works”, which was once owned by the Earl of Jarlsberg. It has no great economic history, but we can assume Gullik's father moved here to work in the mines after relocating from the nearby Narverud mines. 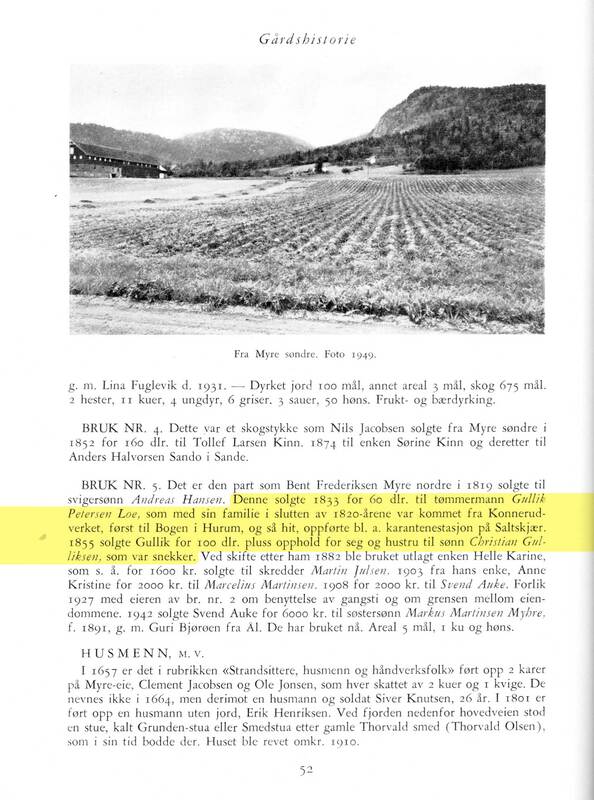 Gullik & Marien's Marriage (1825)The Loe-name occurs in several places in Konnerud of old, and when Gullik had this name, it must reasonably be because he has had his childhood home in one of these places. 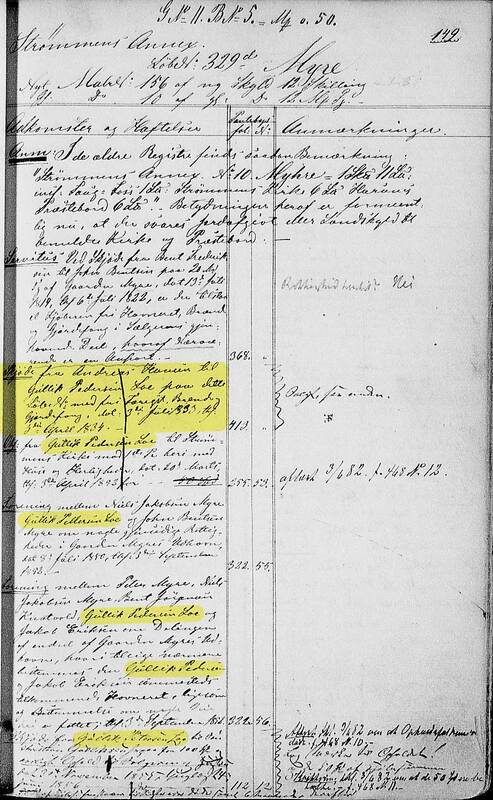 A parcel of land by Veierud and Knatholt is still called Loe (pronounced "Loo" like Lue/Lew) to this very day, probably after a Gudbrand Loe, who lived on Knatholt first in the 1700s. 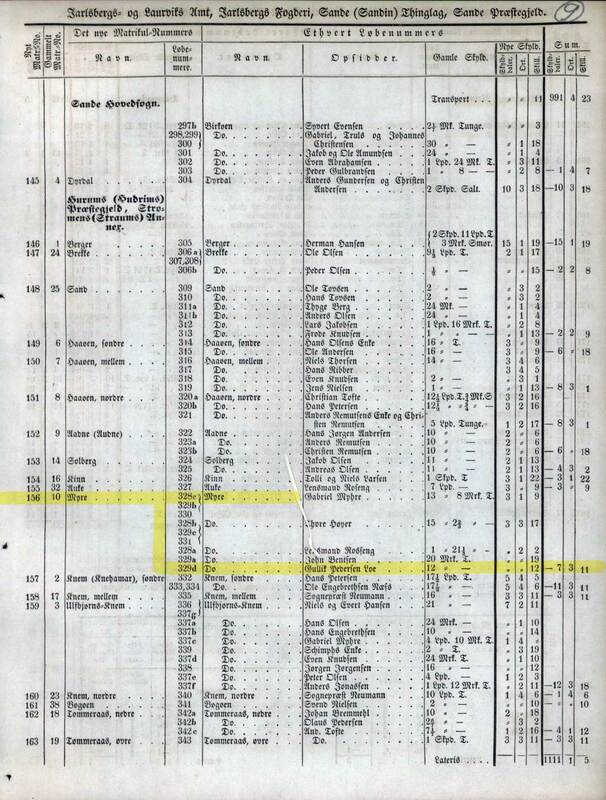 In 1847, Christen C. Loe is mentioned as one of the tenant farmers under Eikholt. Myhre Farm in Strømm Farm Book"About my grandmother (Maren), I do not know much to say. She eventually became blind in both eyes. The last eye she lost by an accident while living in Bogen (under Hov farm in Hurum). The youngest of her children were born after she had lost sight. She died several years after my grandfather." Death and Burial of Gullik (1856)Gustava married a master shoemaker (cobbler) Henrik Kristiansen in Drammen, born 2 May 1869, died 20 June 1940. Three children: Gudrun Jeanette, born 29 August 1902, “Reidar” Christoffer, born 29 April 1905, co-owner of Norløffs Hardware Business A/S, married Inger Eriksen, and Ella, born 18 December 1906, employed in the linen shop. 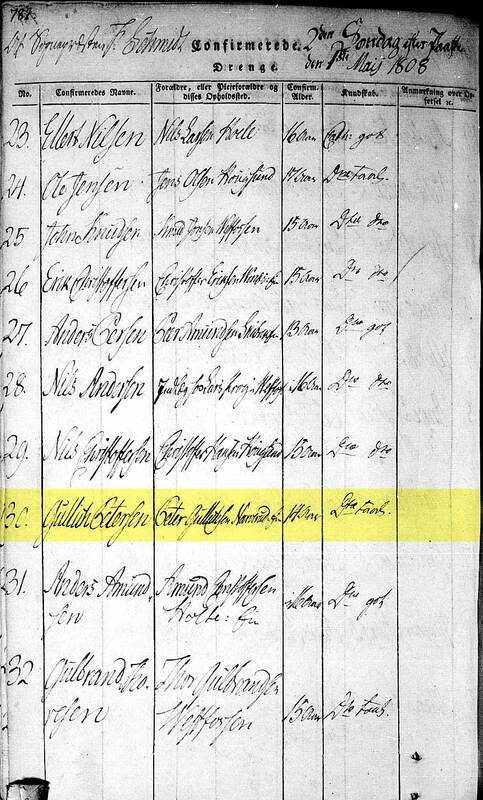 G Christian had a son Martin Christiansen (cousin to our Cornelius Christoffersen). He was a cook at sea and settled in America (Cleveland). In the mid war period (1892) he married Julie, daughter of a ship carpenter Anderas Johnsen (the twin sister of our Birthe Marie Andreasen). 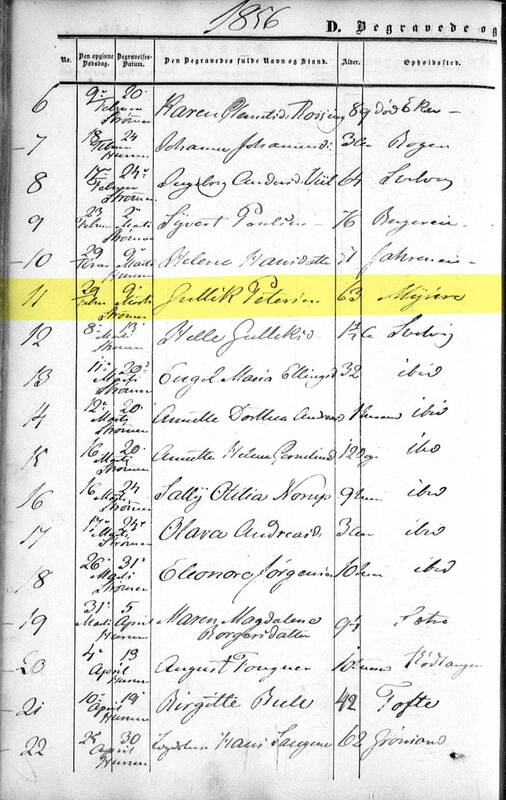 She left with her two children, a boy Christian and a girl Martha, in 1900 to her husband in Cleveland. She died there (in 1919). Christian joined the Navy during WWI and lived until 1959 [and was still alive at the time Sigfred published his book]. Martin died several years ago (in 1919). His mother was from Stokke in Hurum, died of Tuberculosis.